You eat very well in Czech Republic. The tourist center of Prague has many restaurants ranging from rustic finest. Artists: singers, dancers group ... regularly spend some restaurants to make the animation. The Czech Republic has ties with Italy and Italian restaurants are numerous, Notament in Prague. 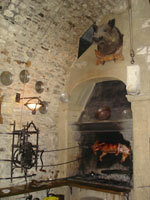 The meat is excellent; Czech wines of the plain south-east are particularly famous. Let yourself be tempted by the local Goulash. side rates, prices in tourist areas are similar to prices in Western Europe, but the amounts are double the quality. You will therefore your money. Less expensive restaurants in the local places barely declined. One street over is sometimes enough to eat, least expensive, and not quantity pantagruesque. Add to bookmark this page Czech-Republic " Czech restaurant " - Firefox do "Ctrl D"